Clean Heat Filter Description: A clean heater is safer and lasts longer. The leading cause of heater failure is dirt and dust build up. But, cleaning your heater has become more difficult by design. Manufactures want you to buy a new heater when the old one gets dirty RIGHT! NOW There`s an answer. The Clean Heat Filter by PollenTec. This Clean Heat filter is compatible with the Lasko 754200 Ceramic Heater model. HEATER IS NOT INCLUDED. Using a filter will slightly decrease your heaters air flow. The product includes the filter only and NOT the actual heater shown in the product photo. Made with our proprietary PollenTec filter material. The technology allows our hypoallergenic filter material to purify the air form your heater with ease. PollenTec is a high tech spun polyester possessing special triboelectric properties that electrostatically pulls and traps particles on its fine fibers for filtering. Allergy Certified: Our filter material PollenTec has been awarded a formal certification from the European Center for Allergy Research Foundation (ECARF). PollenTec has proven to capture up to 98% of airborne pollen allergens and both large and small particles in the air such as household dust, pollen, dust-mite debris, mold spores, and pet dander. Washable and environmentally friendly: The Clean Heat filter is washable, reusable, and most importantly economical. Easy to install and easy to clean, simply follow the provided washing instructions and the filter will look like new wash after wash, for years on end. Made in the USA by PollenTec. The Clean Heat Filter is NOT a genuine Lasko product. The term Lasko and associated fan model names and numbers are used only in this listing to identify the fan models this Clean Heat Filter fits. 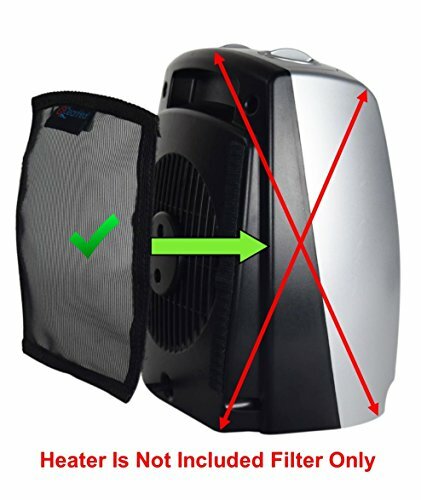 PORTABLE HEATER FILTER: You are purchasing a filter only. Made for the Lasko Model 754200 Electric Ceramic 1500W Heater. HEATER IS NOT INCLUDED. Using a filter will slightly decrease your heaters air flow. The Heater Is sold separately. A CLEAN HEATER IS SAFER: Positively keeps your fan cleaner and running longer. The leading cause of indoor Heater failure is dirt, grime and dust build up. The Clean Heat filter is reusable, washable, and most importantly economical. ELECTROSTATIC AIR FILTER: PollenTec filter technology helps to purify the air in your home with ease. PollenTec is designed to electrostatically pull and trap particles on its fine fibers. 100% Safe for your household. ALLERGY PROOF YOUR HOME: PollenTec filtration material has been certification through the European Center for Allergy Research Foundation (ECARF). Hospital Clean Room Tested, captures up to 98% of airborne pollen allergens, dust, pollen, dust-mite, mold and pet dander. LIFE EXPECTANCY: Our filters are highly effective, long-lasting, easy to install and clean. Made in the USA .